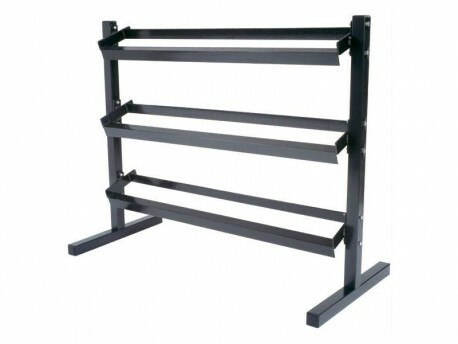 A light-duty rack suitable for home use. We recommend one of our heavier duty racks for commercial environments or for home users who want a more solid feeling rack. 48" wide to hold a full 5-70lb set of hex dumbbells. The front and back lips of each shelf are a short 4.25" apart to hold most models of dumbbells with ease. The dumbbell handle just needs to be at least 4" long.